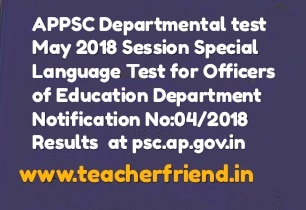 APPSC Departmental test May 2018 Session Special Language Test for Officers of Education Department Notification No:04/2018 Results Downlod at http://www.psc.ap.gov.in/Andhra Pradesh Public Service Commission APPSC Departmental test May 2018 Session Special Language Test for Officers of Education Department Notification No:04/2018 Results at psc.ap.gov.in/APPSC Special Language Test Results at psc.ap.gov.in/APPSC Departmental test May 2018 Special Language Test Results at psc.ap.gov.in. DEPARTMENT – HIGHER STANDARD (WITHOUT BOOKS) HELD ON 10/06/2018 AFTER NOON. The result of any candidate is liable for cancellation at any time. the information furnished by the candidate in the application is found to be incorrect. the candidate has resorted to unfair means/malpractice in the examination hall. the candidate was debarred by the Commission earlier. in addition to the publication in the Andhra Pradesh Gazette which would be considered as authentic Publication for intending benefits to the candidates who are provisionally declared to have passed the Tests.